"Final Resting Places: Grave Markers of Bluegrass and Country Stars"
Saturday, May 28 3:15 - 3:45p.m. 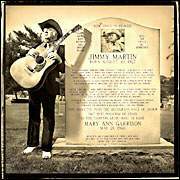 Bluegrass legend Jimmy Martin is shown by his gravestone at Spring Hill Cemetery in Madison in 2002. Mr. Mike Fleming. Georgia Board of Pardons and Paroles. Sharpsburg, Georgia and Dr. Bill Brown. Shorter College. Rome, Georgia. Click HERE for photos of grave sites. Click HERE for photos of the International Country Music Conference. Click HERE to read the paper presented at the International Country Music Conference. A proud member of the SouthEastern Bluegrass Association.